Of the 16 “Biggest Loser” competitors originally investigated, 14 participated in this follow-up study. Weight loss at the end of the competition was (mean ± SD) 58.3 ± 24.9 kg (P < 0.0001), and RMR decreased by 610 ± 483 kcal/day (P = 0.0004). 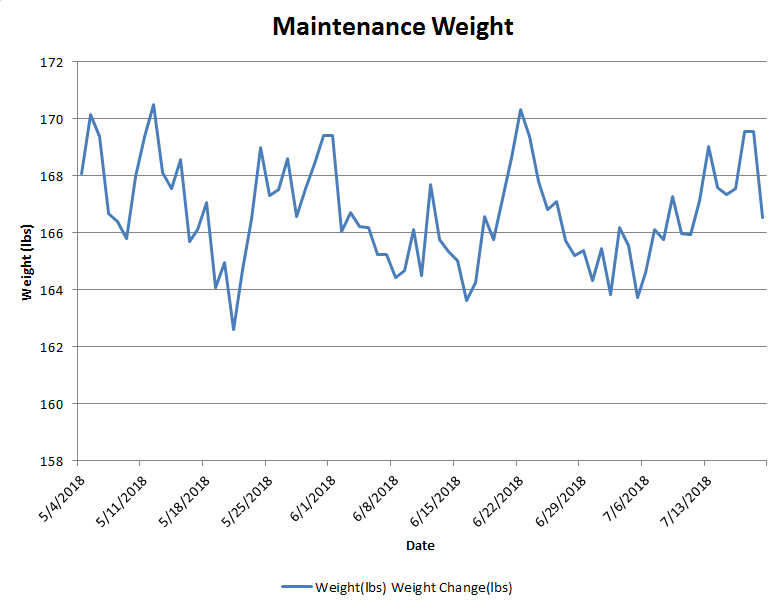 After 6 years, 41.0 ± 31.3 kg of the lost weight was regained (P = 0.0002), while RMR was 704 ± 427 kcal/day below baseline (P < 0.0001) and metabolic adaptation was -499 ± 207 kcal/day (P < 0.0001). Weight regain was not significantly correlated with metabolic adaptation at the competition’s end (r = -0.1, P = 0.75), but those subjects maintaining greater weight loss at 6 years also experienced greater concurrent metabolic slowing (r = 0.59, P = 0.025). Not a very good result. Is the Magic in Low Carb, High Fat? How about neither? How about if the magic is in the increased protein content of LCHF diets? That was the question that this study sought to unravel (Stijn Soenen, Alberto G. Bonomi, Sofie G. T. Lemmens, Jolande Scholte, Myriam A. M. A. Thijssen, Frank van Berkum, Margriet S. Westerterp-Plantengaab. Relatively high-protein or ‘low-carb’ energy-restricted diets for body weight loss and body weight maintenance? Physiology & Behavior. Volume 107, Issue 3, 10 October 2012, Pages 374-380.). Body-weight (BW), fat mass (FM), blood- and urine-parameters of 132 participants (age = 50 ± 12 yr; BW = 107 ± 20 kg; BMI = 37 ± 6 kg/m2; FM = 47.5 ± 11.9 kg) were compared after 3 and 12 months between four energy-restricted diets with 33% of energy requirement for the first 3 months, and 67% for the last 9 months: normal-protein normal-carbohydrate (NPNC), normal-protein low-carbohydrate (NPLC); high-protein normal-carbohydrate (HPNC), high-protein low-carbohydrate (HPLC); 24 h N-analyses confirmed daily protein intakes for the normal-protein diets of 0.7 ± 0.1 and for the high-protein diets of 1.1 ± 0.2 g/kg BW (p < 0.01). 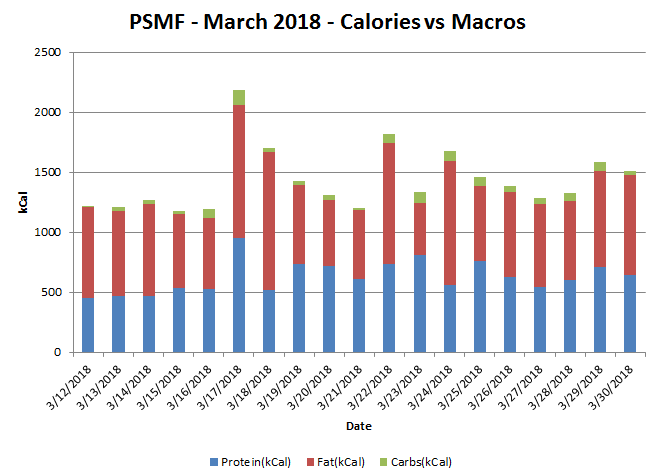 BW and FM decreased over 3 months (p < 0.001): HP (− 14.1 ± 4 kg; − 11.9 ± 1.7 kg) vs. NP (− 11.5 ± 4 kg; − 9.3 ± 0.7 kg) (p < 0.001); LC (− 13.5 ± 4 kg; − 11.0 ± 1.2 kg) vs. NC (− 12.3 ± 3 kg; − 10.3 ± 1.1 kg) (ns). 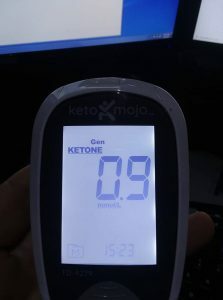 Diet × time interaction showed HPLC (− 14.7 ± 5 kg; − 11.9 ± 1.6 kg) vs. HPNC (− 13.8 ± 3 kg; − 11.9 ± 1.8 kg) (ns); NPLC (− 12.2 ± 4 kg; − 10.0 ± 0.8 kg) vs. NPNC (− 10.7 ± 4 kg; − 8.6 ± 0.7 kg) (ns); HPLC vs. NPLC (p < 0.001); HPNC vs. NPNC (p < 0.001). Decreases over 12 months (p < 0.001) showed HP (− 12.8 ± 4 kg; − 9.1 ± 0.8 kg) vs. NP (− 8.9 ± 3 kg; − 7.7 ± 0.6 kg) (p < 0.001); LC (− 10.6 ± 4 kg; − 8.3 ± 0.7 kg) vs. NC (11.1 ± 3 kg; 9.3 ± 0.7 kg) (ns). Diet × time interaction showed HPLC (− 11.6 ± 5 kg ; − 8.2 ± 0.7 kg) vs. HPNC (− 14.1 ± 4 kg; − 10.0 ± 0.9 kg) (ns); NPNC (− 8.2 ± 3 kg; − 6.7 ± 0.6 kg) vs. NPLC (− 9.7 ± 3 kg; − 8.5 ± 0.7 kg) (ns); HPLC vs. NPLC (p < 0.01); HPNC vs. NPNC (p < 0.01). HPNC vs. all other diets reduced diastolic blood pressure more. Relationships between changes in BW, FM, FFM or metabolic parameters and energy percentage of fat in the diet were not statistically significant. Metabolic profile and fat-free-mass were improved following weight-loss. Also (A. K. Gosby A. D. Conigrave D. Raubenheimer S. J. Simpson. Protein leverage and energy intake. Etiology and Pathophysiology, 28 October 2013). …these trials encompassed considerable variation in percent protein (spanning 8–54% of total energy), carbohydrate (1.6–72%) and fat (11–66%). The data provide an opportunity to describe the individual and interactive effects of dietary protein, carbohydrate and fat on the control of total energy intake. Percent dietary protein was negatively associated with total energy intake (F = 6.9, P < 0.0001) irrespective of whether carbohydrate (F = 0, P = 0.7) or fat (F = 0, P = 0.5) were the diluents of protein. The analysis strongly supports a role for protein leverage in lean, overweight and obese humans. 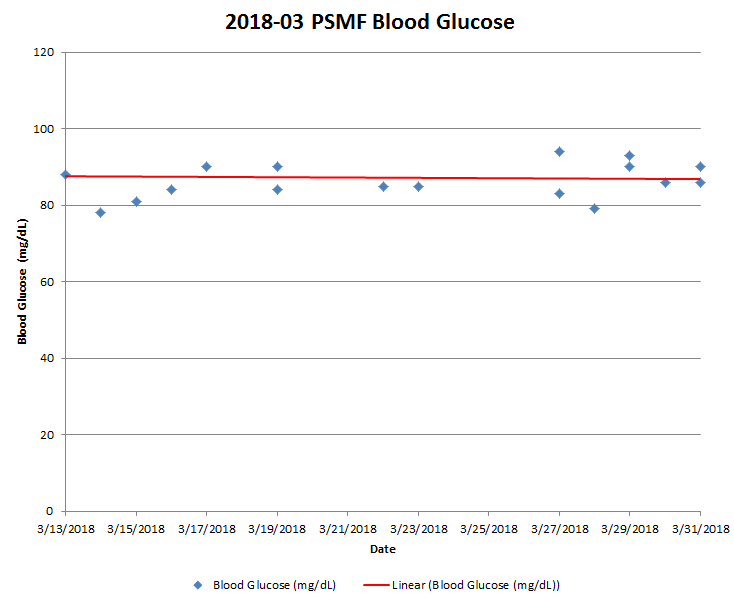 Author DougPosted on July 29, 2018 Categories Low Carb Diet, Protein Sparing Modified Fast (PSMF), Recomposition, StudiesLeave a comment on Is the Magic in Low Carb, High Fat? 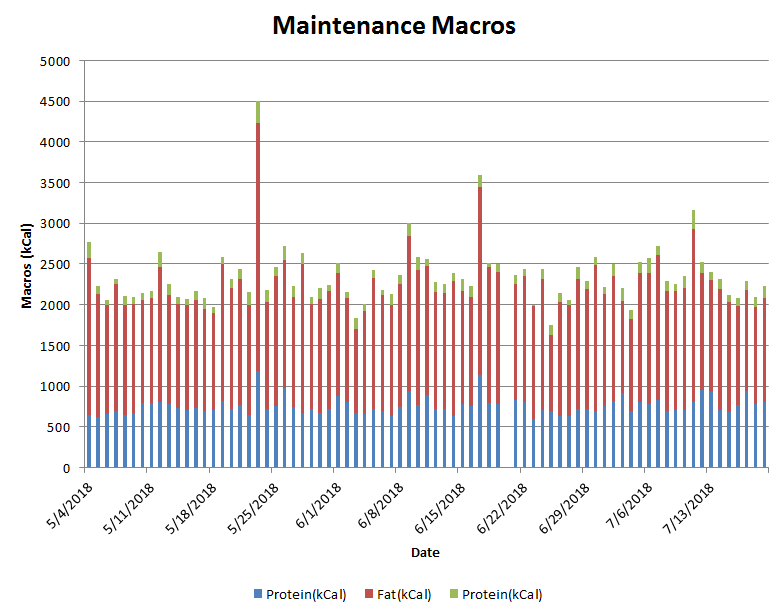 I started on maintenance macros back on 2018-05-04 using Ted Naiman’s formula based on Protein to Non-Protein Energy ratio of 1:1 (grams:grams). 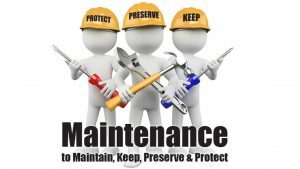 This is a ratio of 181:(159.6+28.5) = 181:188 which is pretty close to the 1:1 ratio for maintenance. I have been at higher macro numbers than my goals but my activity level has been enough to support the higher macros. 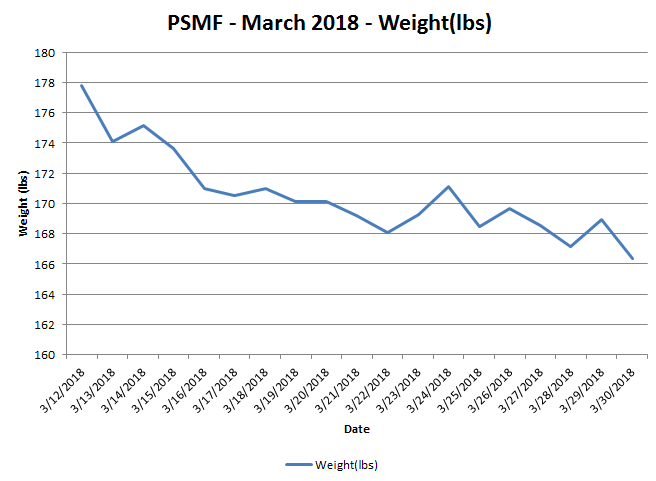 My weight has been stable over the time period with some normal fluctuations. Interesting study that gradually increased carbs and decreased fats shows that fats don’t increase fat in the blood, but carbs do (Volk BM, Kunces LJ, Freidenreich DJ, Kupchak BR, Saenz C, et al. (2014) Effects of Step-Wise Increases in Dietary Carbohydrate on Circulating Saturated Fatty Acids and Palmitoleic Acid in Adults with Metabolic Syndrome. PLOS ONE 9(11): e113605.). Sixteen adults with metabolic syndrome (age 44.9±9.9 yr, BMI 37.9±6.3 kg/m2) were fed six 3-wk diets that progressively increased carbohydrate (from 47 to 346 g/day) with concomitant decreases in total and saturated fat. Despite a distinct increase in saturated fat intake from baseline to the low-carbohydrate diet (46 to 84 g/day), and then a gradual decrease in saturated fat to 32 g/day at the highest carbohydrate phase, there were no significant changes in the proportion of total SFA in any plasma lipid fractions. 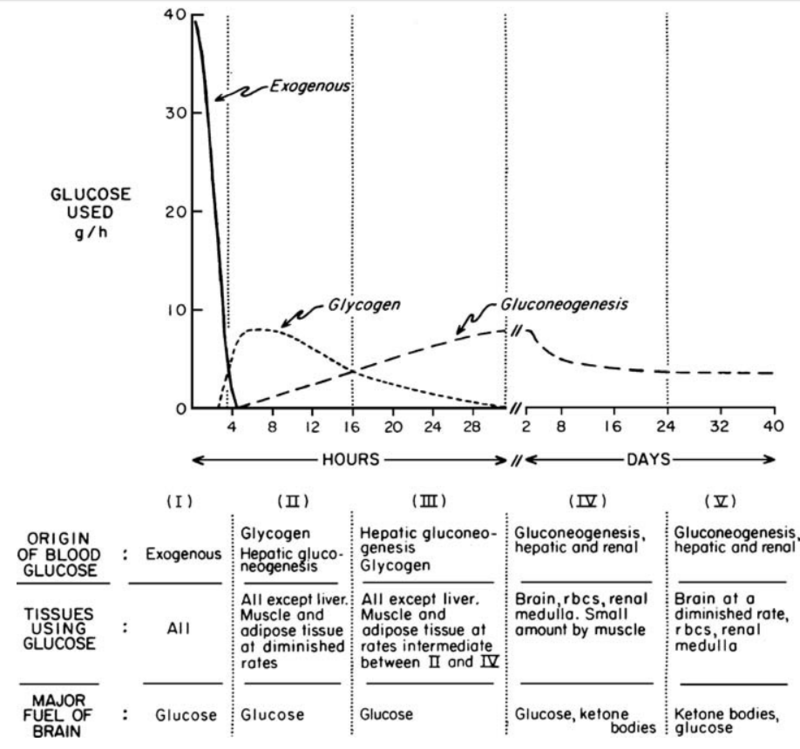 Whereas plasma saturated fat remained relatively stable, the proportion of palmitoleic acid in plasma triglyceride and cholesteryl ester was significantly and uniformly reduced as carbohydrate intake decreased, and then gradually increased as dietary carbohydrate was re-introduced.